Winning Across Global Markets examines how 145-year-old Nokia grew from a paper mill in Finland to a multinational telecommunications leader. Why are Nokia's lessons critical for other companies and industries? While multinationals based in large countries benefit from inherent advantages--such as a home base that often accounts for 30 to 50 percent of their revenues--multinationals based in smaller countries such as Nokia, enjoy no such competitive edge. Nokia, in fact, generates less than 1% of its revenues in its home base. To such a company, global competitiveness is a matter of life and death. With unparalleled access to Nokia's leadership, Winning Across Global Markets reveals the remarkable story of Nokia's resilience and endurance. 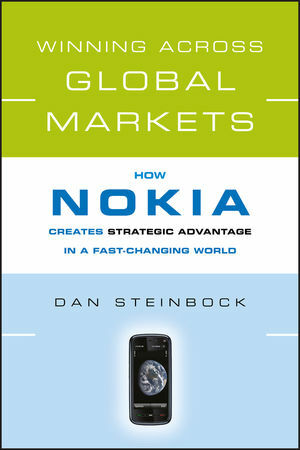 Shows how Nokia's flexibility and focus on its people and local markets drive its distinct global approach. This book provides a roadmap for developing, capturing, and sustaining strategic global advantage in today's ever-changing world. Dan Steinbock is the research director of international business in the India, China, and America (ICA) Institute, which is working to foster knowledge on the rise of China and India and their impact on global markets. A senior Fulbright scholar, Steinbock is also faculty spokesman for the Forum to Advance Mobile Experience (FAME), an initiative by the CMO Council, whose strategic interest communities include over 20,000 global executives across nearly 100 countries. He is on the board of journals in the U.S., Europe, and Asia, as well as on the Market Advisory Board of BusinessWeek. He divides his time among New York City, Shanghai, and Helsinki.